The Oakland Athletics have exercised right-hander Fernando Rodney's $5.25 million club option for 2019. 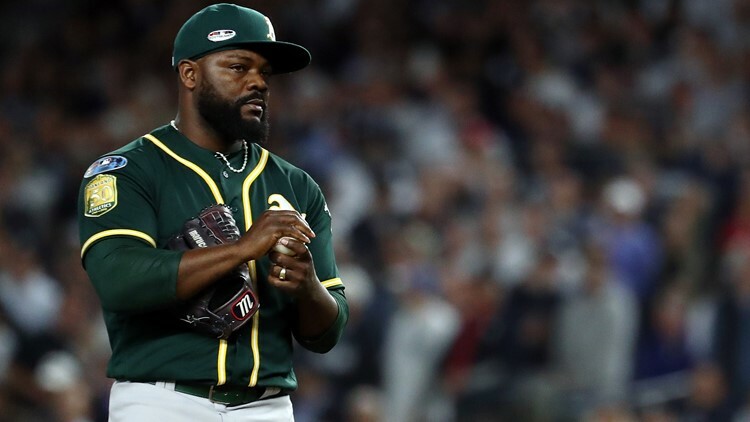 OAKLAND, Calif. (AP) - The Oakland Athletics have exercised right-hander Fernando Rodney's $5.25 million club option for 2019. The A's announced the move on Wednesday to bring the 41-year-old Rodney back for another season. Rodney was acquired from Minnesota on Aug. 9 for minor league pitcher Dakota Chalmers. Rodney went 1-1 with a 3.92 ERA in 22 games for the A's after saving 25 games for the Twins before the deal. Rodney has pitched for 10 teams in a 16-year career and ranks 18th with 325 saves.